Speaking of "Super Tuesday," one of the 22 states holding primaries on Mardi Gras is the "Show-Me State" -- Missouri. Why were you concerned about responding to the comments made by St. Louis University basketball coach Rick Majerus that he favors abortion rights and is pro-embryonic stem-cell research? There are two levels of concern that I had in addressing the issue. Here is someone who makes a point to identify himself as a Catholic and then takes positions that are contrary to some of the most sacred teachings of the Church — teachings with regard to the inviolable dignity of every human life from the moment of its beginning. It gives scandal to other people, Catholics and nonCatholics alike, if they hear a Catholic give an interview to the media, saying that I am proud to be a Catholic but at the same time I hold these views. Then there is a second level, which is that (Majerus) represents a Catholic institution. He is a very prominent member of the St. Louis University community. Whatever his personal positions may be in regard to procured abortion or embryonic stem-cell research, he’s obliged as a public figure from a Catholic university to show respect for the teachings of the Church. For him to say these things brought my concern to a new level. If he had been of another faith, would this have been different for you? No, in a certain sense it would not have been different. He still represents a Catholic institution, and so even though he might belong to some faith or belief that accepts procured abortion, he would be obliged to respect the fact that the Catholic Church — and really, this pertains to the natural moral law — teaches that abortion is an intrinsic evil; and therefore he would not publicly espouse such positions. So it comes down to the fact that he made these public statements. But let’s say for example he was of another faith and he said, "I’m for abortion rights," but he was talking among his friends and family. That would be a different scenario, right? Of course it would. But take for example, what would you think as Catholic parents who have a son or daughter who goes to a Catholic university, and one of the real personalities of the university, a person who is seen to represent the university, is publicly espousing abortion rights? You’d say to yourself, well, this isn’t just. There are some other things that have come up in the media about you and Mr. Majerus. The Review wanted to provide you the opportunity to set the record straight on this issue. The first issue was whether he should be denied Communion or even excommunicated. Did you bring up any of those things with the members of the media? So are you suggesting he should speak with you or another priest about the matter? Would you be open to meeting with him? Oh, of course. The question was asked, "This person who is a prominent figure at a local Catholic university has made these declarations. What do you think?" And I simply said it’s not possible to hold these positions, and I’m deeply concerned about it. But I also said I was confident that the university would address the situation and correct it. I also did not mix myself into the administration of the university. I expressed confidence that the university would do the right thing. Comments have been made that you were angry or spoke out strongly about what Mr. Majerus had to say. What were you feeling when you heard what he said to a reporter while attending a political rally? What I felt most of all was just a profound sadness. At a time when in the Church we need to give such a strong witness to the dignity of human life and the Respect Life Apostolate, this counter witness is being given. I was very sad. Did it upset me? Yes, it did. And my main concern was to correct any perception that it’s acceptable for Catholics to be in favor of procured abortion or embryonic stem-cell research. And above all, no Catholic institution could have its representatives espousing such positions. When people take a position at a Catholic institution, there’s a certain sacred trust involved there. People say it’s a matter of freedom of speech. It’s not a question of freedom of speech. Academic freedom is something quite different. It gives you a freedom to make declarations within your particular area of competence, and according to the canons (laws) for investigation of the truth. It doesn’t give you a kind of heightened freedom to make declarations that are contrary to the truth. I’d like to use this situation with Mr. Majerus as a springboard to talk about Catholic identity in general. We hear it in other scenarios, like, "I don’t want to be told how to vote." Or, "Why is it so important that we speak out against abortion?" What do you think a Catholic should have done in this kind of a situation, where a Catholic was presented with an opportunity to say something publicly? First of all, it can be a wonderful occasion for someone from the media to ask you to give a witness to the truth about the inviolable dignity of unborn human life and the dignity of the infant in the womb. If there is a Catholic who for some reason is struggling with his or her adherence to this, then the correct thing to do is to be silent — certainly not to expound error or to air doubts that you’re trying to resolve in your own mind. But to seek the help of a spiritual director to clarify these things. 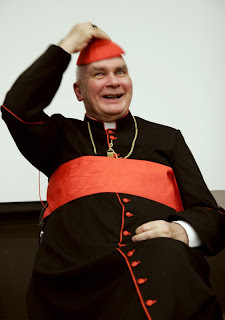 What if a Catholic were to say, "Archbishop Burke, I’m not struggling with it. I think abortion rights are important." How do you respond to that? Finally, you mentioned it’s your responsibility as the shepherd of your flock to guide situations where there’s some kind of confusion about the teachings of the Church. We don’t always see that with all of our bishops. I know a number of people who have said, "Why is our archbishop saying this, but another bishop somewhere else isn’t doing anything at all?" What do you say to that? I don’t know what all those other situations are (personally), and that’s strictly speaking not my business. I think what we ought to do in the archdiocese and I have to do as archbishop is say, ‘Are these situations that need to be addressed in our archdiocese?’ If they are, the archbishop better be addressing them, or he’s failing in his duty. And he shouldn’t worry about whether he appears to be different from some other bishops. We don’t know what all those situations are and what judgments those bishops are making. But sometimes people say to me, you seem to be unusual, and I’m not. I don’t think I am. I say to myself, let’s look at the situation. Is there something unusual about a bishop saying that it’s wrong to be in favor of procured abortion? I’m a Roman Catholic priest and bishop. What else would you expect me to say? In other things Mizzou, newly-retired Bishop John Leibrecht of Springfield-Cape Girardeau is looking forward to a new ministry back in the trenches; after 23 years leading the downstate diocese, Leibrecht will do fill-in work in parishes as a "senior priest in service." Foley emphasized the importance of public relations in the Catholic church in communicating the news of the church to the media. He particularly stressed the need for an open and honest dialogue between the church and the media. “I think people are always interested in people,” he said. Foley said this type of coverage was vital to showing the positive side of the church and improving the church’s perception in today’s media coverage. “I thought people needed good role models,” he said. When asked by a member of the audience whether he felt the U.S. media was intentionally critical of the church, he said that in his experience that has not been the case. He said the church must always act with candor when dealing with the media, particularly when the news could paint the church in an unfavorable light. The cardinal’s stance surprised some of those in attendance.